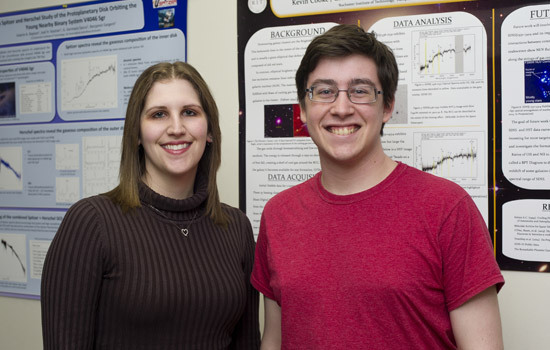 Two graduate students in the Rochester Institute of Technology astrophysical sciences and technology program were recognized with Chambliss Astronomy Achievement Student Awards for their outstanding research posters at the 223rd American Astronomical Society meeting in Washington, D.C., in January. Kevin Cooke and Valerie Rapson were among 31 winners chosen from nearly 450 students who entered the student competition. The Chambliss awards recognize exemplary research by undergraduate and graduate students who present posters at the society meetings. RIT was represented at the society meeting with 19 poster presentations by high school, undergraduate and graduate students, faculty and an alumnus, as well with a dissertation and oral presentation.